ActiveRain is a place that supports you and the need to create a successful and rewarding Real Estate presence and Blogging portfolio. Just by being a member here, you’ll have access to many real estate services, professional contacts, real estate opportunities, and best of all – the camaraderie of like-minded people. Now that you’re a member, create your profile, tell others about yourself and why you joined. Invite affiliates and other Industry Professionals. See who else is already here and say hello to others. Once you have the chance to explore ActiveRain, read some Blog posts, make a few comments, join a few groups etc, you’ll quickly discover why so many of our members are here. 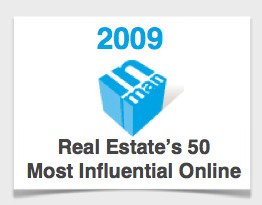 This is a network and community like none other in the Real Estate Industry. As a FREE member, you’ll be able to enjoy the networking, the sharing of valuable knowledge and experience, and be exposed to a variety of tools that our members are using to promote and grow their business. 1. Develop and Foster Potential Referral Partner relationships. For the most part, many of us refer ‘out of area clients’ in the blind. We don’t always know the agent on the other end very well. Our members have cultivated some incredibly deep and meaningful friendships with other members they would not hesitate to entrust their valued clients. 2. Having access to the sheer wealth of information that is being shared every day. It’s like taking a drink of water from a fire hydrant. All of our members have learned more valuable, practical ways, using expert information here on AR that has had a direct and positive impact on their business. In some cases, more-so than some of the continuing ed classes they have paid for and traveled around the world to attend. 3. You are afforded a safe, non-threatening, encouraging environment to get your Blogging feet wet, and to learn the basics of implementing social media and social networking into your Real Estate Business and Marketing Plan from some of the “BEST” Professionals and Experts in the industry. When you are ready to take your Social Networking and Blogging experience to the next level as a “RainMaker Member“, here’s a “no risk”, “no obligation” test drive so you can experience for yourself the “value” and “benefits” the Rainmaker membership offers. Sign up for the first month for $5.00. This will give you full access to all that ActiveRain has to offer. Give us 30 days to show you how you can benefit from the tools here, and if you’re not completely satisfied with the results and rewards, then at least you’ll have the peace of mind knowing that you didn’t miss out on something that later you might have regretted. I’m 100% positive, you’re going to be happy you joined. See what thousands of other members are saying. The cost of having your content crawled & indexed by the search engines, and accessible to consumers is well worth the monthly subscription fee. 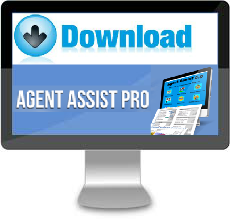 Very few other platforms can empower you to achieve such excellent page rank as ActiveRain. 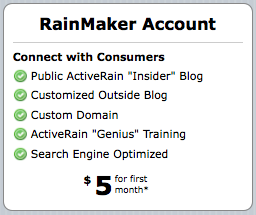 The additional benefits of a rainmaker account including but not limited to your own “Multi-Authored – Custom Outside Blog”, “Hit Router and IDX Lead Generating Solutions”, and the “support and training” available from our staff, are just a few of the reasons that consideration to upgrade should be made by every non-rainmaker member. You can’t fill your car with gas for the week, for the price it costs you to be a Rainmaker per month. ActiveRain is a tool and vehicle to get the job done, and make life simpler, just like a car. In fact, you can be much more effective building business here than you ever could in your car, and at 1/4 the price. The value and power of the relationships you’ll build here can’t be bought at any price. If you ever have any questions or need assistance here, please give me a call or email me. “I will respond and I do answer my phone.” Enjoy your experiences and successes here. From the Staff and Support Team here at ActiveRain, we not only wish you the very best, we’re here to help you achieve it. Not sure where to start? Here’s 3 Easy Steps: 1. Pick up the phone 2. Dial My Number 3. I will help you.